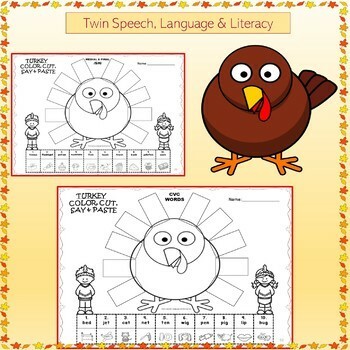 This is a super cute and fun packet to use for Thanksgiving-themed speech therapy sessions or anytime during the fall season! 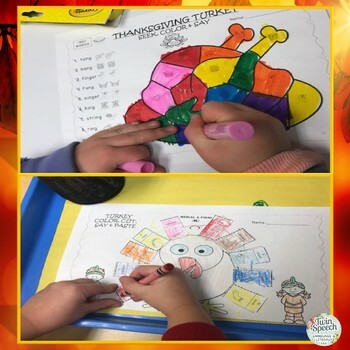 It's a unit that is filled with NO PREP worksheets that will encourage your articulation, phonology and verbal expression students to seek out pictures, color them and also say them aloud. This product is very complete. 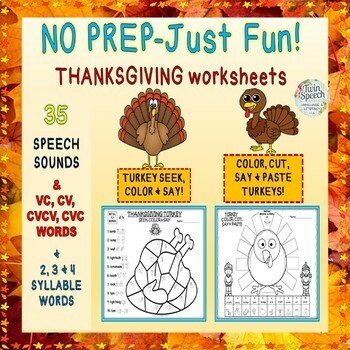 We have included easy and fun worksheets for 35 different speech sounds, /S/ and /L/ blend words, and also VC, CV, CVCV, CVC, 2, 3 & 4 syllable words for working with your phonology and verbal expression students. In our experience, this packet will provide an useful worksheet for every student on our speech therapy caseload that is working on expressive communication. Speech therapists may find the picture of the correct lip and tongue placement for each sound useful for working on sound placement before and during the therapy activity. Please take a close look at the preview to see the contents of this unit and sample pages. We want to make sure that you have a nice understanding of what you are buying before you do. By viewing the preview, you will be able to gain a closer look at this NO PREP- JUST FUN! Thanksgiving Turkey Articulation! Thank you so much for stopping by Twin Speech to check out a newly made product and happy new year to you all! Come visit us over at our blog! We always have fun reviews and giveaways going on and we work hard to provide useful information about speech, language and literacy for everyone!